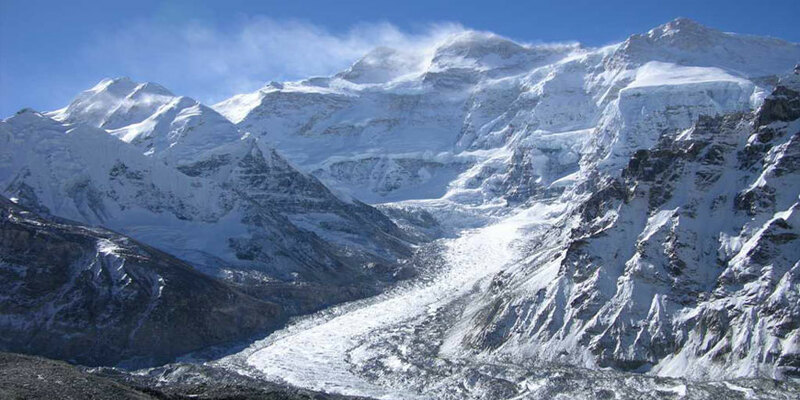 Kanchenjunga base camp trekking is one of the most thrilling trekking destinations in Nepal. Mt. Kanchenjunga (8586m) is the world’s third highest mountain offers a varieties of landscapes, cultures and panoramic views of Himalayas including the Everest, Lhotse, Makalu, and Kanchenjunga itself, the four of the worlds five highest mountains, therefore, the trekking in this route makes the trek rewarding. Mt. Kanchenjunga lies on the border of Nepal and Sikkim (India). It is one of the unspoiled trekking trails located in the eastern part of Nepal and there is hardly found this kind of trekking trails anywhere in the world. The trekking to the Kanchanjunga was opened only in 1988 for trekkers. Kanchenjunga area is the inhabitant of Sherpas ethnic groups who are rich in culture and tradition. Rais, Chhetris, Brahmans are other ethnic group of this region. Monasteries, chhortens, temples, prayer walls are the representation of this area. It is also believed that the abominable snow man ‘YETI’ exists in the region. With these all the features, Kanchenjunga trekking has been the most popular trekking destination among the tourists who come in contact with Advent Himalaya Treks. Kanchenjunga Conservation Area Project Kanchenjunga Trekking(KCAP) is spread in an area of 2,035 sq. km and is a rich diversity of wildlife including snow leopard, Himalayan black bear, musk deer red panda and others varies species of birds including Amphibian, pheasant, red-billed blue among others. The trekking in the area begins from Suketar Taplejung, which is accessible by air, or from Basantapur which is accessible by road. The route passes through the lush of rhododendron forests and climb on the high alpine terrain beyond the village of Ghunsa. Throughout the route, you will have to view the astounding sceneries of Kanchenjunga south face. Subsequently, we head to Selele pass and trek on the Yalung Glacier and finally we reach at Kanchenjunga base camp. Subsequently, exploring the area, we return to Taplejung and then return to Kathmandu.